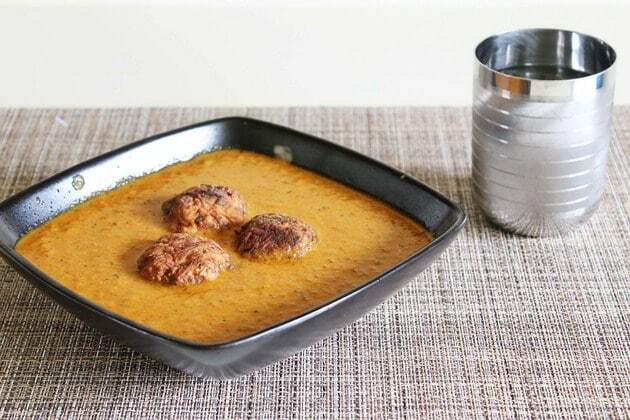 Lauki kofta recipe – kofta made from bottle gourd (lauki) and besan, then deep fried in the oil. 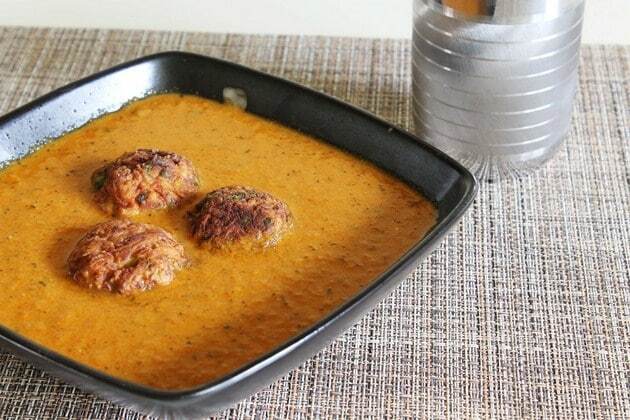 These koftas are simmered in creamy, flavorful onion-tomato-yogurt gravy. Lauki or bottle gourd is also known as Ghiya or doodhi or Dudhi or Opo squash. In this summer season, it is available in all Indian veggie market. It has more water content, so it is helpful to deal with the heat, and it prevents exhaustion in hot Indian summer. Doodhi is a kind of vegetable that most of the people don’t like its taste. My husband doesn’t like any kind of gourds at all. So I have to be smart and tricky to include this vegetable in our diet. So instead of making sabji with chopped lauki, I hide them in the dish by grating it. So I usually make lauki chana dal, muthia, thepla or soup and sometimes this kofta curry. He will eat these dishes without any complain. The first time he tried the lauki kofta curry, I didn’t tell him that kofta is made from lauki. I just told him that this is mix veg kofta curry. He even didn’t realize that I was lying. The soft koftas with gravy will melt in your mouth. yes, if you have lauki hater in your family, make him/her this dish. I have added some yogurt to the gravy which makes it little creamy and rich tasting. 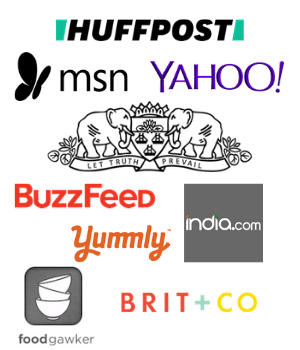 I have seen some recipes online; they use cashew paste or cream to make it creamy and rich. You can use any. But I find the yogurt as a healthy option. 1) Wash the bottle gourd, peel it and grate it using box grater. I have used 1 small sized lauki. Now measure the 1 1/2 cups grated lauki. Then squeeze out the water as much as you can. Keep the lauki water, we need this nutritious water to make the gravy. 2) Take squeezed lauki and rest of the kofta ingredients (besan, cumin powder, red chili powder, salt, green chili, ginger paste, cilantro) in the bowl. 3) Mix all and make it like dough. It will be sticky. Increase or decrease the besan quantity as needed. All the ingredients should come together. It will depend on your lauki’s water content. 4) Meanwhile heat the oil in Kadai for deep frying. Grease your hand with some oil. Take small portion and make round balls. 5) By the time, oil should be hot enough to fry. Drop the kofta carefully into hot oil and fry it till they are golden brown from all the sides. Keep moving the koftas in between for even browning. Be careful. If oil is too hot then kofta will remain raw from inside. If oil is not that hot then kofta will absorb more oil. 6) Once koftas are brown from all the sides remove them on paper towel lined plate. 7) Take all the ingredients for paste (onion, tomato, ginger, garlic, green chili) in grinder. 8) Grind into a smooth paste and keep it aside. 10) Then add prepared ground paste. 11) Cook it till all the moisture evaporates and oil start to leave from the sides. Do stir in between and make sure that it is not sticking to the bottom of the pan. 12) Add turmeric powder, red chili powder, cumin powder, coriander powder and salt. 15) Mix it well and cook it for a minute. 17) Lower the heat and then add whisked yogurt. We are lowering the heat, so yogurt will not curdle. 18) And immediately stir it well till everything is mixed. Now crank the heat to medium again and bring it to a boil. 19) Add garam masala and kasoori methi. Mix it well. 20) Add kofta, stir gently and serve. Add the koftas right before the serving, otherwise kofta will absorb almost all the gravy and becomes soft and soggy. Storing the curry: Best served the day it is made. If you want to store for next day, refrigerate kofta and gravy separately in containers. The next day, reheat the koftas in a microwave. Also reheat the gravy, you may need to adjust the gravy consistency by adding splash of water. Now add kofta to the gravy and serve right away. Serving suggestion: Serve lauki kofta with paratha or naan or tandoori roti or phulka roti. It can be served with jeera rice or pulao like green peas pulao, vegetable pulao. Wash the bottle gourd, peel it and grate it using box grater. I have used 1 medium sized lauki. Now measure the 1 ½ cups grated lauki. Then squeeze out the water as much as you can. Keep the lauki water, we need this nutritious water to make the gravy. Take squeezed lauki and rest of the kofta ingredients in the bowl. Mix all and make it like dough. It will be sticky. Increase or decrease the besan quantity as needed. Heat the oil in Kadai for deep frying. Grease your hand with some oil. Take small portion and make round balls. Drop the kofta carefully into hot oil and fry it till they are golden brown from all the sides. Keep moving the koftas in between for even browning. Once koftas are brown from all the sides remove them on paper towel lined plate. Take all the ingredients for paste in grinder. Grind into a smooth paste and keep it aside. Then add prepared ground paste. Cook it till all the moisture evaporates and oil start to leave from the sides. Do stir in between. Add turmeric powder, red chili powder, cumin powder, coriander powder and salt. Mix it well and cook it for a minute. Lower the heat and then add whisked yogurt. And immediately stir it well till everything is mixed. Now crank the heat to medium again and bring it to a boil. Add kofta, stir gently and serve. Its looking yummy and delicious. Thanks for sharing such easy and nice recipe.